UK Poker News continues its coverage of emerging talents in British and Irish poker by focussing on Ian "At-It" Bradley, a 22-years-old poker player from Teesside in North-East England who in a short space of time has made great advances in poker culminating in a recent appearance on Sky Sports in the William Hill Grand Prix Poker Tournament. In Part 1 of this interview, Ian talks about his introduction to poker by local friends, his recent experiences of competing in the televised William Hill Grand Prix and also about the poker charity tournaments in his native North-East. In Part 2 to be published later, Ian discusses in detail his adventures in Las Vegas, his goals for the future and the origins of his nickname! UKPN: Hello Ian, thanks very much for taking some time out to chat with UK Poker News. UKPN: How did poker come into your life at the outset and was it mainly an online or offline route that you trod? IB: I was introduced to poker by some friends I played pool with and was lucky enough to win my first ever tournament in a £10 rebuy competition. I loved every minute of it, and just wanted to play again and again! I kept on improving quickly and I regularly got results. I started in the Casino, and didn't play on the Internet for money until I had played for a few months, although I was practicing for free in the library at university on the computers, while I should have been doing some work. But you can do both! At first, I was playing in all the local tournaments around Teesside and Newcastle. Then in January of 2005, I travelled to my first festival in Luton, where I managed to get my first result coming 3rd in the £200 Omaha competition. Since then I have tried to travel about as much as possible and it was capped off with an amazing trip to the World Series in Las Vegas. 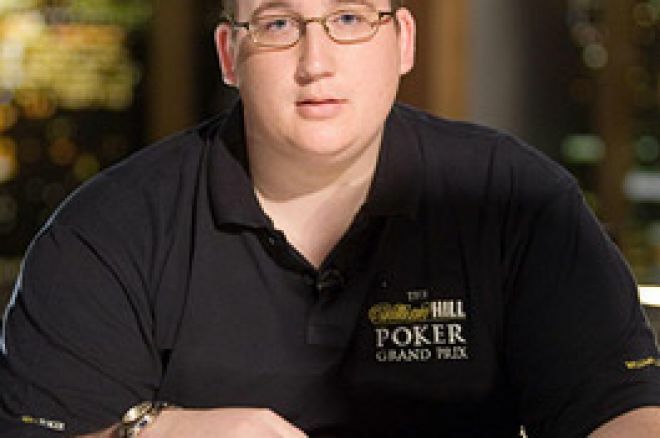 UKPN: You were seen on Sky Sports recently in a heat of the William Hill Grand Prix playing with the likes of Liam Flood, Xuyen "Bad Girl" Pham, Antonio "The Magician" Esfandiari and top British poker players, Peter Costa and John Shipley. Can you try to convey to us how it felt to sit at the same poker table as these top players in front of a camera crew! IB: It was brilliant, to be honest I was not fazed that much! I had played with a lot of the table before, and once you got down to playing the poker you could not really notice the cameras. Before the heat I was obviously aware of Antonio's reputation and he certainly lived up to it, I nearly dropped my drink when he flat called in late position instead of raising! The line up was fantastic, as it was for all of the heats. Bambos (Xanthos) was one of my Late Night Poker heroes, he has the ability to be the quietest player at the table then come out with some outrageous bluffs! When you sit at the table with top class players you cannot fail to improve and learn, I do feel playing this competition helped me become a better player and I hope there will be a lot more chances for me to play with this calibre of player again! UKPN: Now that the programme has aired, are there any particular hands that were played in your heat that stand out for you, whether or not you were involved in them, which might demonstrate why these players are at the top of their profession? IB: Probably too many to mention, the hand when I got Peter Costa to call me with tens when I had aces was good for me. Peter lives in America now but is a Nottingham regular whenever he is back. So I know he had probably been speaking to some of the players from there, like Tony Kendall, Julian Thew and Greg Hill who all know me well. So he will have been told that I might bluff a bit, (I don't know why!) this is how I tried to make the hand look and it paid off. He is too good of a player to commit his chips if I had reraised him again pre-flop, so I had to deceive him by playing the hand slowly. I was in great shape after that hand, and was disappointed not to go on to win the heat. However Liam Flood and Peter played brilliantly after that and didn't give the table much of a chance, jumping on any of Antonio's raises very quickly! That is why these players are at the top and have been for so long, they are excellent readers of the game and the majority of the time they make the correct decisions on whether to call, pass or raise! Liam deserved to win the heat, he put a lot of pressure on the rest of the table and doing that on such a top class table is very difficult. UKPN: Did playing in a TV studio against that level of quality opposition affect your normal game in any way and what did the experience teach you about your own game? IB: Hopefully I showed that although I respect this level of player I'm certainly not afraid to play against them and have confidence in my own game to do just that. I am normally an aggressive player and early on I had raised quite a few pots that were not shown, which I am glad because I don't think I won one of them! I had decided to play tighter because of the structure of the event, it is normally the best tactic and then to increase your aggression later on. However I do think my seat positioning restricted my play slightly, especially when the blinds increased. Peter was short chipped for a lot of the game so I didn't want to raise and have to call his reraise with marginal hands. Also Antonio's raises were picked off by either Peter or Liam and I think this was a key factor into why they were the last two remaining! As our chips dwindled they were able to apply more and more pressure. Overall the experience showed me that even though I am capable of playing very well, I can still make bad decisions and the more I cut those out the better I will become! Also I would like to improve how I gain information from players, Antonio was excellent with this from the bets he made and it is something I am trying to work on. UKPN: Can you remind us how you obtained your seat at the Grand Prix tournament? IB: I had heard about the event and the £6000 price tag and then thought nothing of it, until I was at the Vic in London and I was talking to Phil Quayle who was heavily involved in the organising and running of the William Hill GP. He had told me that William Hill were running satellites for the event on their website and that I should have a go. So a couple of weeks later I decided to try the £60 tournament where there were 100+ runners and one seat guaranteed. I won the seat, which I was very pleased about because it was a tough event in itself! The 6 seater tables certainly suited my game and I was able to get very aggressive later in the competition, and the Blonde poker railbirds certainly helped me along the road to success! UKPN: Back in August, you entered and won the £25 North East Charity Shield No Limit Hold'em tournament in Newcastle, not far from your home town. The win brought you a £2,000 purse and added to your reputation in poker circles. Can you give some more details about that charitable event, what it was held for and the aims of the charity concerned. IB: The North East Charity Shield is the most prestigious charity poker tournament in the UK, not necessarily in terms of prize money but in terms of quality fields and aggressive players - 2005 saw Joe Beevers take 63 rebuys and Ram Vaswani 40 with Carlo Citrone not far behind. In previous years the NECS has been won by players of the calibre of Stephen Liu who in my opinion is probably one of the best players in the country, and someone who I try to learn from. I got involved in the tournament through people I had met in the poker world, it was the first time I had played it, and it will not be the last as it was a brilliant day. The event went as I expected to be honest, quite a few rebuys and a good day of poker along with poker players putting their wallets to good use! I played well on the day and was lucky enough to win the event, hopefully I will defend my title this year and a lot more money can be raised for charity. Poker4Charity is a campaign of the registered charity Game for Life, the first charity in the world to be founded and funded by the poker community. Game for Life was born out of Poker4Charity. Game for Life is a children's charity that has, under its own name and the Poker4Charity name, given thousands to help sick, disabled, life limited and financially disadvantaged kids. Two schools in the Tsunami hit Sri Lanka are to complete construction in February 2006, and Game for Life will maintain them indefinitely, a block of four classrooms are also maintained by Game for Life at the Sanga Medium School in Nepal. Game for Life is also committed to helping youngsters in the UK - amongst those already helped are special care baby units in Luton and Newcastle, children's hospices in Loughborough, Luton and Newcastle, children's hospital wards in London, Nottingham and Newcastle, a play centre for disabled kids in Nottingham and a children's activity organisation on Merseyside. Ed note: Ian Bradley played at William Hill Poker where seats at the big tournaments are won.